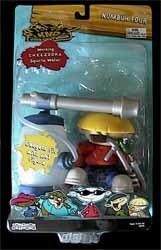 Numbuh Four comes with a fully working C.H.E.E.Z.O.O.K.A. (Cannon Heartily Ejects Extra Zesty Oodles of Cheese Karelessly Around) gun, which fires a jet of water. He also has a S.H.A.V.E.R.A.M.A. (Shoots Heckuv Alotta Very Electric Razors And Multiple Armaments). A full-size version of the S.H.A.V.E.R.A.M.A. is available which fires foam darts (by cranking a handle). 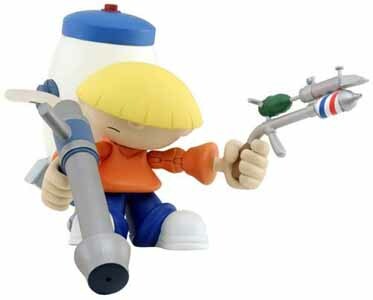 At the same time you can pressing the trigger to send out a jet of water or sooper stringy ammo (depending on which you've loaded into the gun's body). The version that comes with this action figure doesn't fire anything though.